As kick-off approached on a grey autumn afternoon, a banner was passed between Cardiff City and Leicester City’s fans – two tribes setting rivalries aside, uniting to pay their respects. After a wreath was laid on the pitch, the two sides gathered around the centre circle for a minute’s silence and the usually boisterous Cardiff City Stadium fell profoundly silent. The crowd was consumed by the stillness. Once the game was under way, Leicester’s supporters sang in memory of their owner and roared encouragement to their players. Cardiff’s fans joined in. This was a rare, harmonious atmosphere. And after a week of tributes, Leicester provided another with a courageous victory, clinched by Demarai’s Gray’s goal, which prompted emotional celebrations that will be etched in the club’s history. Below, we hear from fans, players and managers about the emotions on a day that few at Cardiff City Stadium will ever forget. Di Statham, of the Foxes Trust supporters’ group, is a lifelong Leicester fan and was in the away end at Cardiff City Stadium. It’s been a very emotional day. We didn’t know what to expect. The Cardiff fans were brilliant. In the minute’s silence, you could have heard a pin drop. We really appreciated that. Not only the team but the whole Leicester squad came out for the minute’s silence and after the game to applaud the fans. We won for Vichai and it was nice to see some of the Cardiff fans had stayed behind after the game as well. 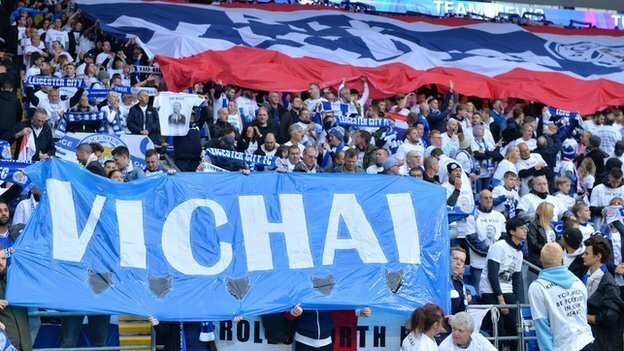 So thank you, Cardiff fans. Today was hard but next week [the first home game since the crash] will be even harder. It’s Remembrance weekend as well. We always do a big thing about that, so next week is going to be doubly difficult as we remember the fallen. Going back to the scene of the accident will be difficult. Cliff Ginetta is the Leicester City Supporters’ Club chairman and was also among around 3,000 Foxes fans who travelled to Wales. It’s been a very sad, emotional week and everyone has felt it in Leicester. The family atmosphere we’ve created has been shaken to its core, so it’s been a tough week to get through. All credit to the lads for playing. It was very odd for the fans to get to the stadium and whip up some enthusiasm, but we had to do it for Vichai and what he did for Leicester City. They called him The Boss but he was the best boss. He was such a nice chap and he did everything for the club and the fans. I must praise Cardiff and their fans, how they treated us before the game, giving away free food in the concourse and things like that. These things put it all in perspective. Ian Stringer has been covering Leicester City for more than a decade, including their remarkable Premier League title triumph in 2015-16. I’ll have a few abiding memories, and it has been emotional. I’ve never had to commentate on a game like that before in my life, and I’ve commentated on 600-odd matches. What got me was the Cardiff City flag which moved to the Leicester City end, and then the Cardiff fans took the Leicester flag to their end. I know Cardiff lost and there’s a fallout from that with tactics and so on, but the gesture from the Cardiff fans to change flags, a flag with the Leicester City badge on it – let’s not let that pass us by. I will never, ever forget the gestures of Cardiff City Football Club, who have been classy, dignified and magnificent. Osian Roberts has been part of Wales’ coaching staff since Gary Speed’s time in charge. Following Speed’s death in November 2011, Roberts led the team for the tribute match against Costa Rica at Cardiff City Stadium three months later. Roberts was back at the ground for Leicester’s win over Cardiff. It was incredibly hard and days like this bring those emotions to the fore, especially in this stadium. The players will have had a huge shock last weekend with this tragedy. And throughout the week they will have paid tribute and tried to deal with those emotions as individuals and as a group of players. I spoke to Leicester midfielder Andy King and he said, as we’ve been hearing from the other players this week, that they wanted to put on a performance that Vichai Srivaddhanaprabha would have been proud of. In our match here, Gary Speed’s memorial match, I remember players like Ashley Williams, the captain, coming in at half-time and saying, “I can’t move, I can’t move my legs, they’re like lead”. The emotional situation affected the players physically, they couldn’t even run around the pitch, let alone perform. Claude Puel was appointed Leicester manager by Vichai Srivaddhanaprabha. It was a difficult game, they did their best. We deserved to win and it is fantastic and it is for the chairman. It was tough to prepare this game, important to find the good balance between emotion and concentration. I want to congratulate the players. Today is the first step, now we can continue. We will have a difficult week or so. We go to Bangkok for the funeral, we come back in the middle of the week and we have a training session to prepare against Burnley. That will be our first game at home with the fans. Cardiff City manager Neil Warnock saw his team lose, meaning they drop into the relegation zone. It’s been a strange week, surreal really, I’m glad it’s out of the way, if I’m honest. I was quite pleased with the players – and the fans – in the circumstances, with the respect they showed. I can understand Leicester’s players, the closeness they had [to Vichai]. But it was so difficult for our lads too, I’ve not seen anything like it really. We had to have a word with them before the game to remind them they had to play the game. Nobody could fault the effort really – on another day we might have got something. Leicester goalkeeper Kasper Schmeichel has been at the club since 2011. He was one of the first people on the scene of the helicopter crash and was in tears during the minute’s silence before kick-off. He, along with the rest of the squad, flew to Thailand for the funeral straight after the match. Today was difficult. Coming out for the warm-up was tough. The first 10 minutes I couldn’t steady myself, I was shaking a little bit. But it was nice to get a win to take to Thailand and hopefully we did his family proud. It has been hard, we have tried for a few hours a day to be professional and train hard, but everyone wanted to play and win for his family. His family have been strong, the courage they have had. I feel just an overwhelming sense of pride of being part of the family that Vichai built and the extended family of Leicester City. Everyone grieves in different ways and the opportunity was given and we wanted to go to the funeral. We are a family and wanted to pay our last respects together. Cardiff centre-back Sol Bamba played in Saturday’s game. He spent the 2011-12 season with Leicester in the Championship. Vichai was a good man. I had the chance to meet him and he is a big loss. It was difficult for us, the whole build-up wasn’t easy to handle. But that is not an excuse, the gaffer warned us about this. Obviously we pay respects before and after, but during game we are professional. The fans were magnificent all season, and in particular today, showing the whole football family sticks together. Wes Morgan captained Leicester to their Premier League title triumph in 2015-16 and led the team at the Cardiff City Stadium. You can see by our reaction at the end of the game how much we wanted to get the win and do it for the chairman. We were very close to him. We know what his wishes were. He used to come down at home games, have a joke and a laugh, always say, “Want win and three points” and we did that today. It has not been an easy week, we had to try to hold our emotions in today and do the best we can. We have a very emotional connection with the fans, so we stayed until the end and celebrated victory with them. Catfishing: What happens when someone steals your identity?